Festivalgoers spread out in front of the UPMC Stage. The Pittsburgh Irish Festival was celebrating its 25th anniversary, and as I had never been to it before, I was definitely going this year. My original plan was to go on Saturday, but the rains kept coming. Being part Irish, I felt slightly ashamed that I put off going until skies were fairer on Sunday. After all, hadn’t my fellow Pittsburgh Irish marched in the St. Patrick’s Day parade during the blizzard of the century in 1993? The festival is a nonprofit organization whose mission it is to showcase and maintain the rich cultural awareness of Irish history and tradition that exists in Pittsburgh. It is one of the top Irish festivals in the nation and is led by sisters Nan and Maura Krushinski. In addition to the organization’s staff, there is a large corps of volunteers who are a driving force behind the festival’s success. The Pittsburgh Irish Festival is held each September the weekend after Labor Day. 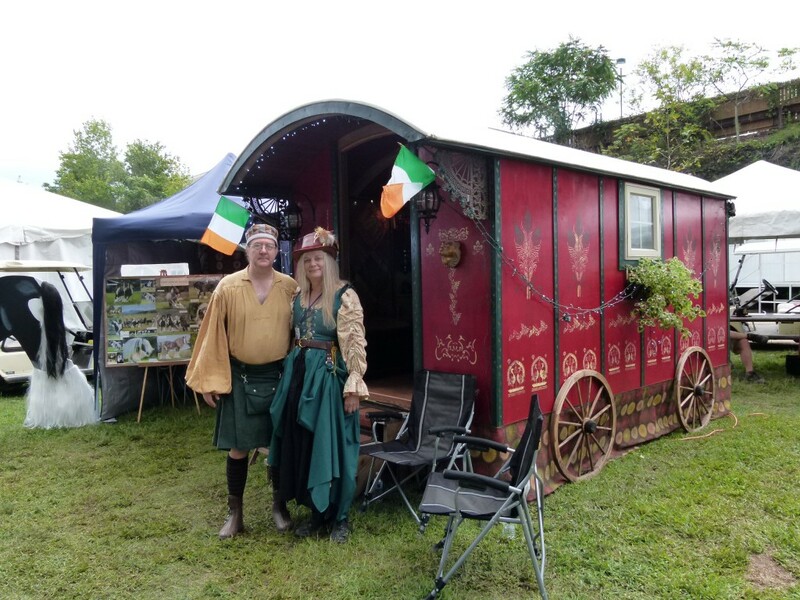 Dressed in period garb, James Rumbaugh and Lynette Garlan stand in front of an Irish caravan. 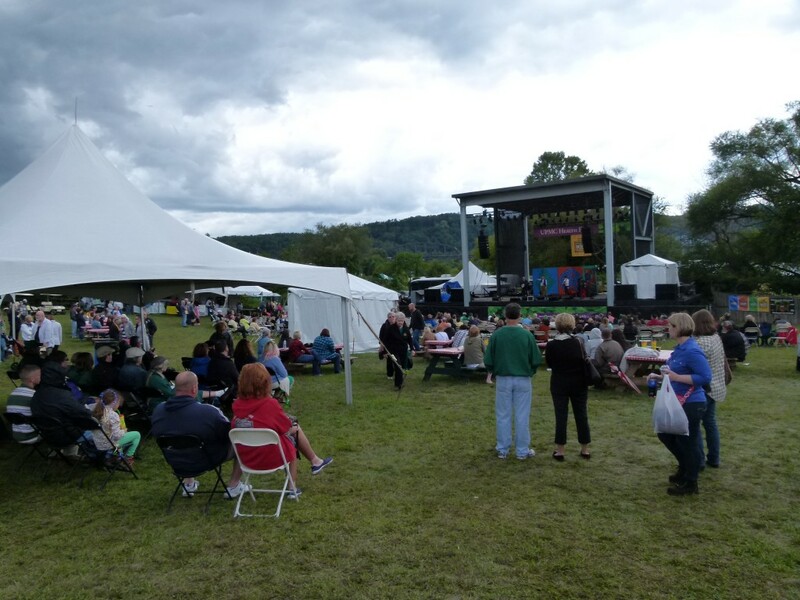 When you enter the festival grounds—a bucolic setting on a plain, bordering the Monongahela River—the sites and sounds remind one of an Irish village. There was an old red caravan that would have been pulled by horses years ago. Standing outside in period costumes were Lynette Garlan and James Rumbaugh. They were both very informed in explaining the caravan and the lives of the people who roamed the Irish countryside in them. 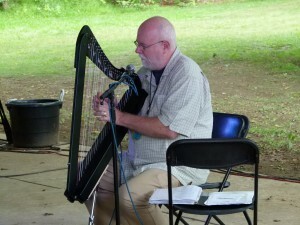 Dennis Doyle playing the harp. Deeper into the festival grounds, a man was entertaining an audience by playing the harp, singing, and telling tales. It was very enjoyable to see such an accomplished harpist, Dennis Doyle, up close. It was now well into lunch, a good time to visit the Irish Food Pavilion. Many different traditional foods of Ireland were offered, including Irish beef stew served in one’s choice of a bowl, a bread bowl (from Prantl’s Bakery), or on a baked potato. At other stands, the purveyors served up fish and chips, salmon, crab cakes, oysters, corned beef sandwiches, sausage sandwiches, tea, cookies, and Baileys Irish cream flavored ice cream. There was even a stand that sold lamb and sweet potato hash. Talk about European fusion food! I tried the Irish sampler platter prepared by some smiling Irish eyes. The sampler consisted of bangers and mash (sausage and mashed potatoes); ham and cabbage; sausage, ham, and pieces of cooked potatoes; potatoes and sauerkraut; and a hearty roll. Oh, what potato-y goodness! If Irish food doesn’t excite you, a Thai food stand was spotted along with Seivers festival foods trailers. 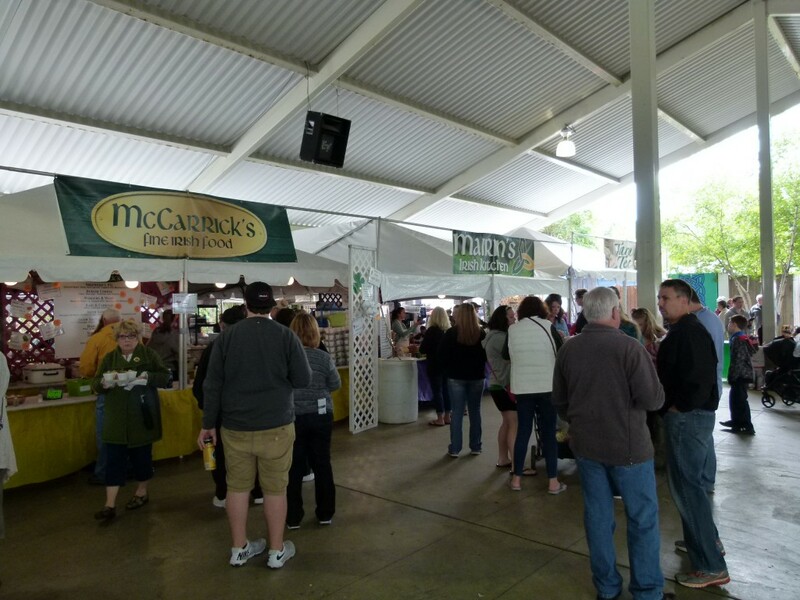 The Irish food pavilion offered many different options. On the beverage front, there were soft drinks and hard drinks, including a selection of beers, with Irish mainstays Harp and Guinness leading the pack. 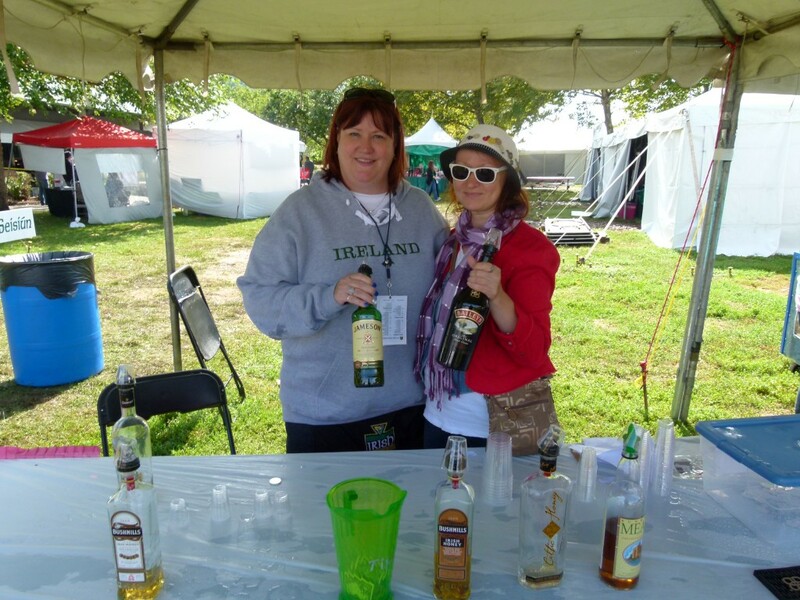 The festival also featured a few whiskey tasting booths where, for a fee, you could buy a shot of Irish whiskey. Selection highlights included Jameson, Bushmills, and Clontarf 1014. As I was not familiar with Clontarf 1014—and for story research purposes only—I purchased a shot from the friendly and charming whiskey girls. I found the Clontarf 1014 to be a very smooth whiskey. Most Irish whiskey’s are triple distilled for a steady and pleasant taste. Magners Irish Cider had a large presence at the festival and offered several tasting sessions. Lawrenceville’s Arsenal Cider House was also on hand. Friendly festival whiskey sellers Kim Smith (l.) and Svetlana Norman (r.) showcasing the offerings. One of the two Marketplace tents. A good way to escape any rain is to head into one of the two Marketplace tents. 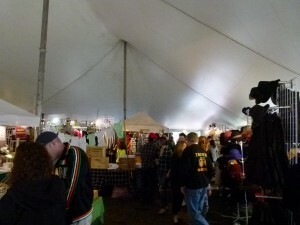 Local Irish organizations had tables set up in the Marketplace tents. At the Irish Centre table, a nice woman named Peggy said something to me that I didn’t quite understand. I replied, “Sorry, I didn’t hear that.” She repeated what she had said, “Cè hi bhuil tù?” With a twinkle in her eye, she handed me a card and at the same time said what the card read, “How are you?” She had been speaking to me in Gaelic (the traditional language of Ireland). 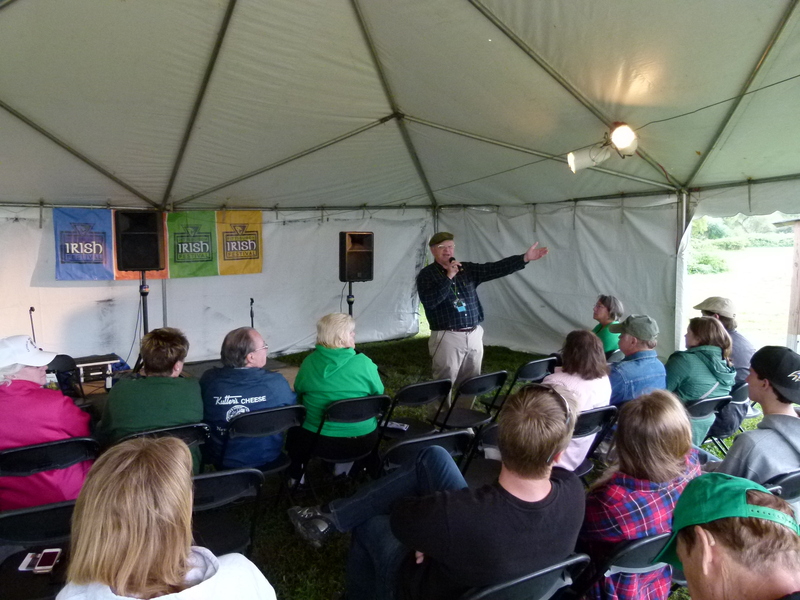 Other interesting festival activities, like storytelling, genealogy, and history, gave deeper insights into Irish culture. In the tent’s merchant stalls you could find just about everything Irish—clothing, jewelry, glassware, and trinkets. After emerging from the marketplace, I was the proud owner of an Irish rugby jersey and a glossy sheet detailing my family’s history and coat of arms. There were many different forms of Irish music bands and performers. Earlier, while eating my Irish sampler, I heard a U2 song performed live acoustically from one of the smaller music tents. Inside was a duo, a man on the acoustic guitar and the other playing a flute. The young guy working the sound board said the band was Abbots Cross. 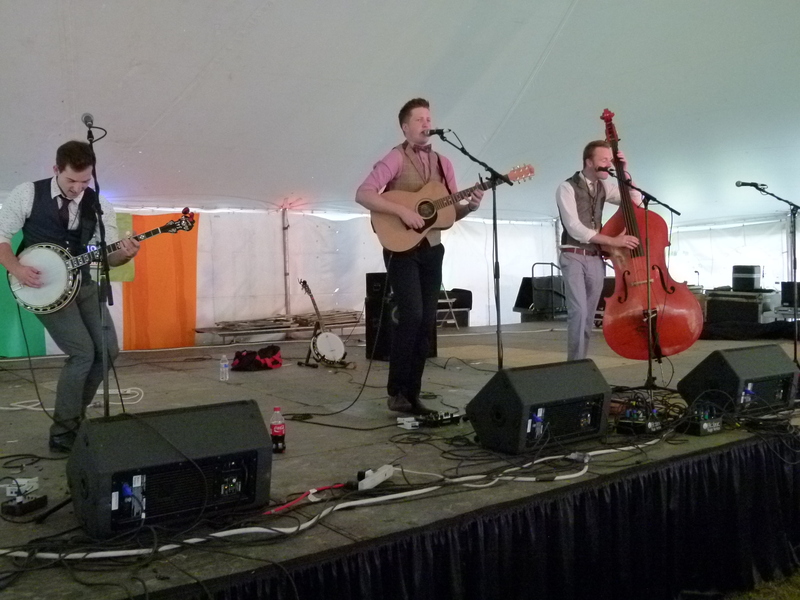 JigJam was then performing on the Celtic Spirit Stage. 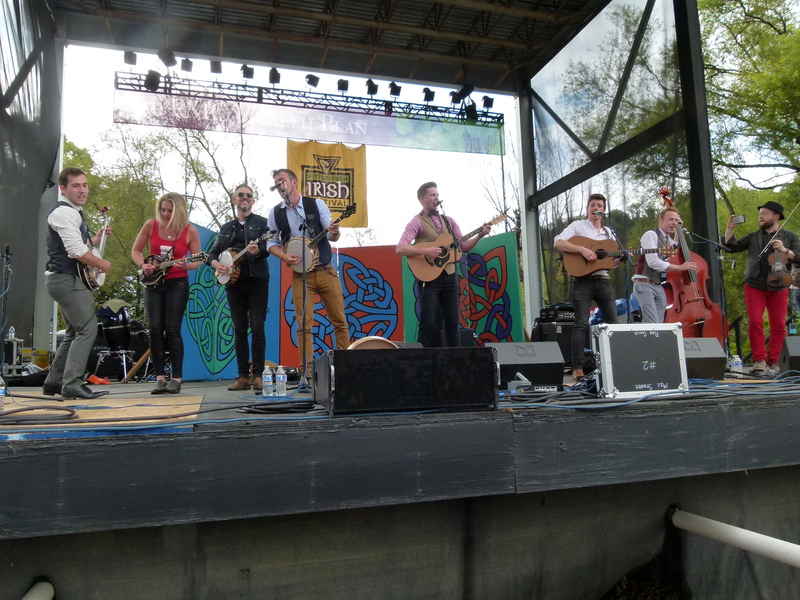 They are a group of young, charismatic musicians from County Offaly, Ireland, and on their first U.S. tour. When exiting the tent, sounds of pipe and drum music could be heard in the distance. 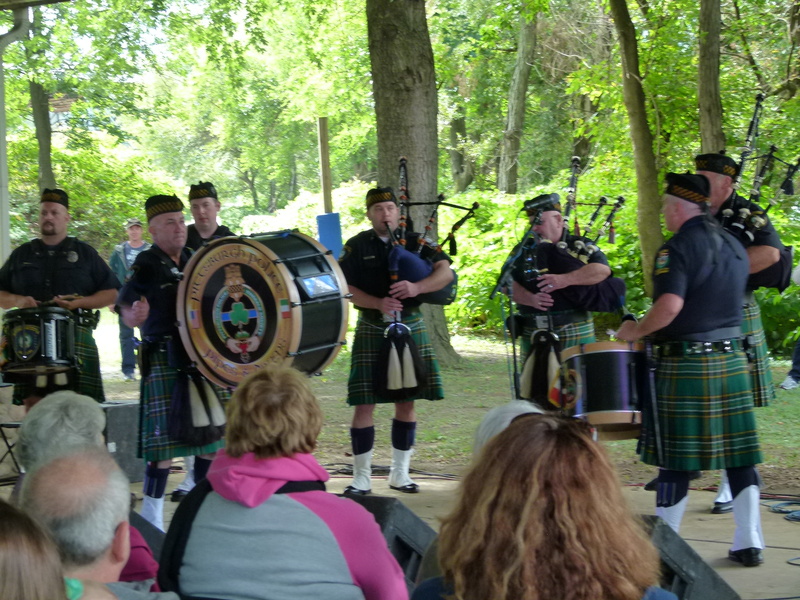 Under a different open-air tent were the Pittsburgh Police Emerald Society Pipes and Drums unit. They looked resplendent performing in their ceremonial outfits of kilts, boots and legging, and special caps. Makem and Spain leading the audience in a Irish song sing-along. I wanted to catch Makem and Spain and headed back to the Celtic Spirit Stage. 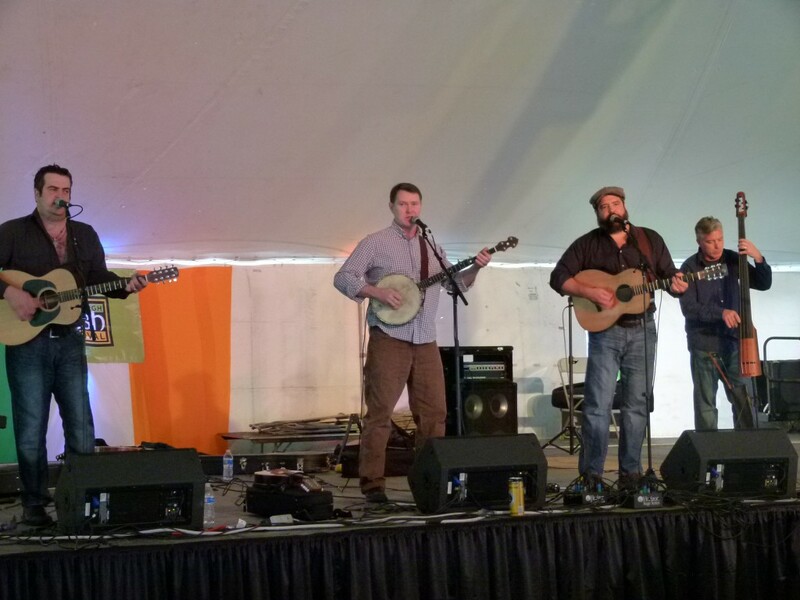 They were playing fun, traditional Irish songs, and they encouraged the audience to sing, which many people did. Mickey Spain cracked that there’s an old Irish saying that says, “When you see four Irishmen together, you’ll soon see a ‘fifth. '” The crowd laughed. Unfortunately, I didn’t get to see noted Pittsburgh performer Cahal Dunne or any of the dance groups. As I headed out, many people were watching a band on the UPMC stage, and I went over to see who was playing. It was Galway’s We Banjo 3, a happening Celt-grass group. The large audience, in the seats and spread out over the green, were all enjoying the show. Then one of the band members said, “Pittsburgh, we only have two songs left, and we want everyone up and dancing for them.” We Banjo 3 tore into their next song, and people shot up and were dancing all over the place. Members of other bands who had or were getting ready to perform joined the group on stage, and some, including members of Scottish bag-rock band Red Hot Chilli Pipers and JigJam, joined people dancing in the front of the stage. Not to be left behind, young dancers from the performing dance groups joyfully came streaming out of the gates from the backstage area. Everyone was dancing and having fun. 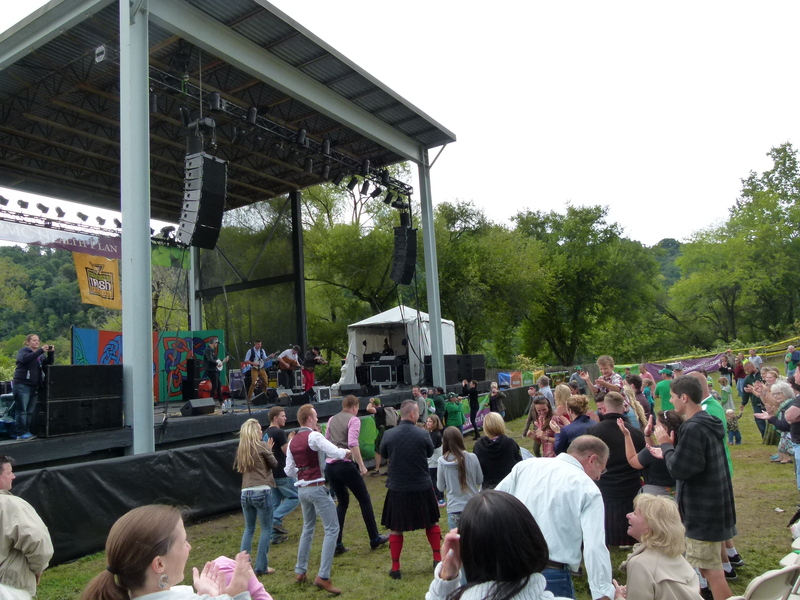 Whether looking for a lively party with great music, a deeper exploration of Irish heritage and culture, or both, one should frequent the Pittsburgh Irish Festival. I definitely will return, rain or shine. Please click on photo to view slide show. 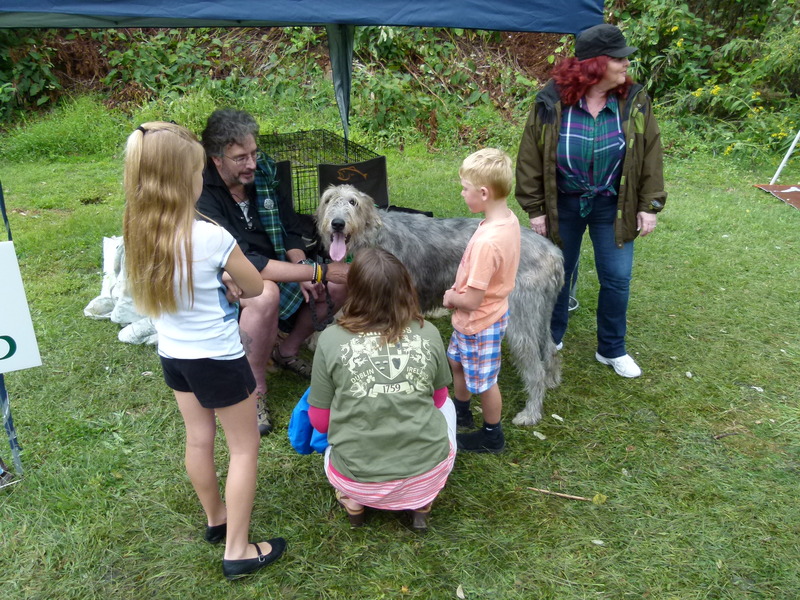 Irish wolfhounds owner Joel Black offers Murphy to the kids for petting. We Banjo 3 and performers from other groups jamming together. We Banjo 3 has the crowd up and dancing. The Pittsburgh Police Emerald Society Pipes and Drums unit in action. Jigjam performing on the Celtic Spirit Stage. Storyteller and author David McDonnell tells two tales from ancient Ireland as part of his "Becoming King" talk. 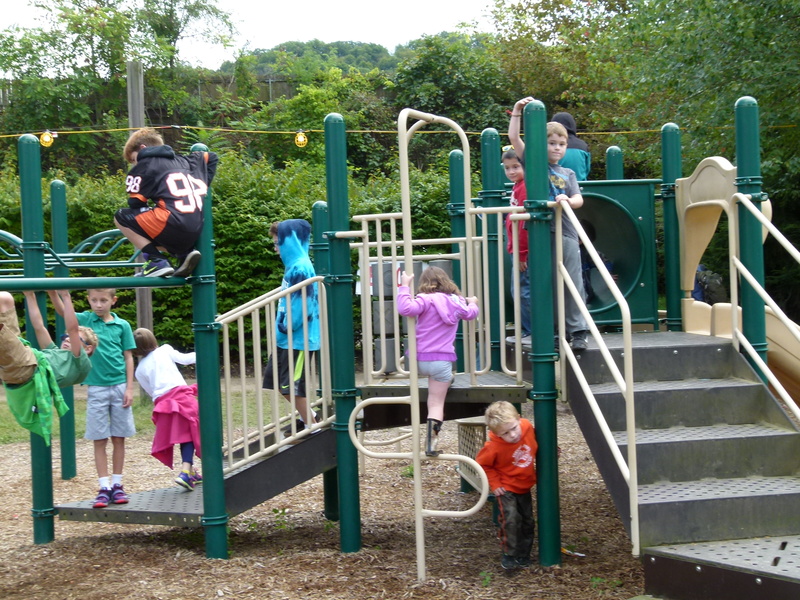 There were plenty of fun activities for the wee ones. 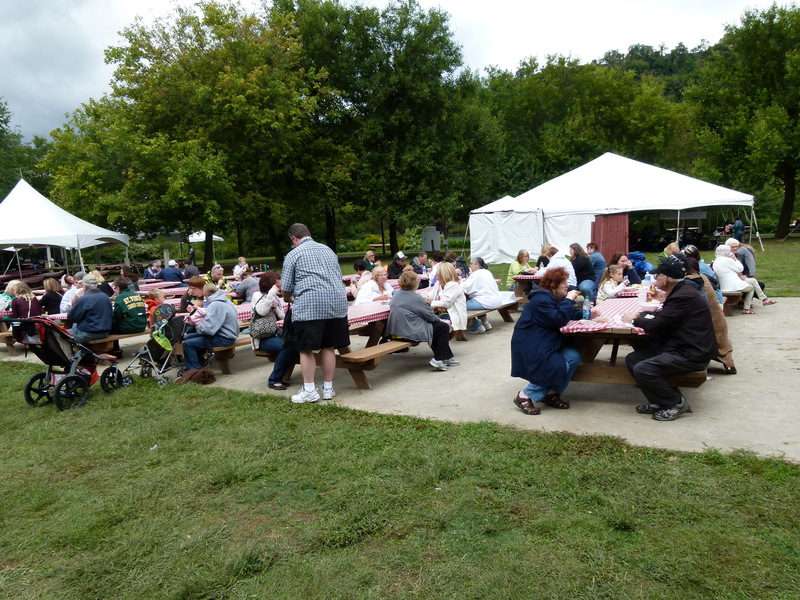 Friends and families relax and eat in the picnic area. Rick Handler is the executive producer of Entertainment Central and loves a fun festival.